While many people obsess over their waistlines, few of us give much thought to the trouser waistbands we gird about ourselves every day. It’s worth doing so at least once, as the waist is the site of so much sartorial possibility. What follows is our definitive round-up of all things trouser-topping in the world of Alan Flusser Custom. Because his innovative but stubborn tailor Frederick Scholte insisted on making only pleated trousers cut for braces (or suspenders), the Duke of Windsor famously had to have his belt-looped plain-front trousers made in New York — an arrangement his wife dubbed “Pants Across the Sea.” Men today will face no such hurdles, as both methods of maintaining trousers at full mast are now accepted in all quarters. However, this is not to say that both methods have the same pros and cons. With pleated trousers, the front "bracer buttons" are generally sewn at the first pleat, to help the trouser line hang properly. Belts are most advisable with sport or lower-rise trousers which want to sit closer to the hips, which today are pretty much the norm. We encourage our clients to try and wear their suit- tailored trousers as close to their natural waist as possible, for a variety of advantages that become compelling when explained correctly. 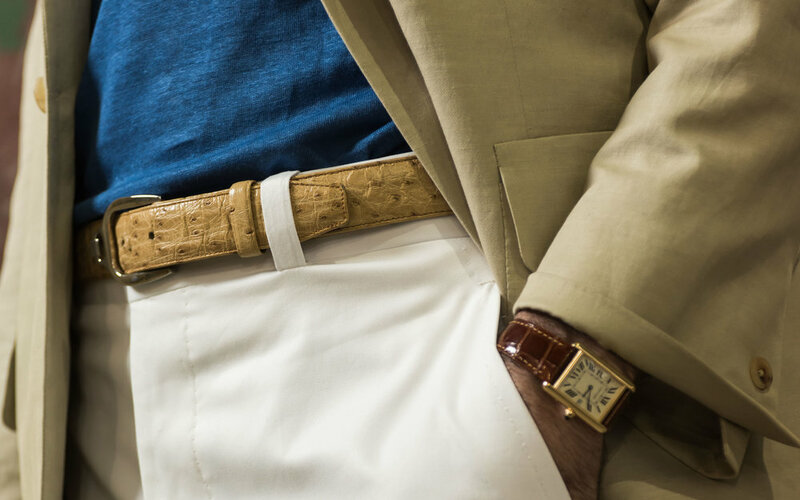 That said, we find many opportunities to enjoy the extra sartorial possibilities that come from belt-wearing — including fine alligator and ostrich to complete a dressier outfit, and bolder ribbon belts in silk and polyester for a dash of color and whimsy when paired with warm-weather sportswear. Belt loops are now almost exclusively fitted to the waistband itself, although there was a pleasing fashion in the 1930s through 50s for waist-worn trousers with “dropped loops” — that is, placed slightly lower, affording a visible line of trouser waistband above the belt. On belt-less trousers, the overlapping (left) side of the waistband is generally extended beyond the centerline of the trousers for a few inches to effect a cleaner, more dressy aplomb. In the spirit of revisiting alternative waistband treatments, we resurrected one of Alan’s own from the 1980’s, a double tab number that can be styled in different ways. Another variation on this theme is the more dramatic Gurkha waistband, which extends a wide, tapered waistband further across the wearer’s right side and secures it with a buckle. Somewhat resembling a cummerbund, the Gurkha waist was originally featured on uniform shorts donned by Gurkhas (fierce Nepalese troops who fought for the British in World War II), on which overlapping waistband elements actually extended on both sides. Our double extension tab waistband, resurrected for custom commissions this year from the Flusser archives. Our take on the classic Gurkha waistband - here in a wool, silk, and linen separate trouser. Bespoke and high-end ready-to-wear trousers often feature a split, or “notched” rear waistband intended to add some flex to the stiffened waistband in response to the wearer’s movements. It is also a vestigial remnant of the “fishtail” trouser, so named because the rear panels of the trouser are raised above the waistline to form two peaks (each an attachment point for braces) which resemble a fish’s fins. Once ubiquitous — and still a practical option with three-piece suits, where they prevent shirt from peeking out below the vest — the fishtail trouser is now an antique sartorial curiosity, available only by custom order. The split-back waistband offers a touch of added comfort, by allowing the waistband to stretch and flex as the waist expands. Side-tabs are cloth strap and buckle attachments that straddle the lower seam of the waistband on each side. When adjusted inward, they tighten the waistband helping beltless and non-suspended trousers from sliding down the torso. A variation on this concept is a single gathering strap placed across the back of the trousers. Commonly seen on old fishtail and military trousers, the back-strap was a staple of classic “Ivy” style while now enjoying a fashion moment on high-end denim bottoms. Brace-cut trousers without side-tabs generally feature a “DAKS” waistband. A trademarked contraction of “Dad’s slacks,” this was the first non-belted sport trouser which was originally designed for golf. The “DAKS” style waistband features an elastic strap running through a tunnel in the rear waistband, emerging on either side to attach to one of two or three buttons. In theory, the adjustable tension eliminates the need for braces; in practice, the DAKS waistband is most effective at concealing and distributing a little comfortable fullness in the waist of trousers worn with or without braces. No discussion of trouser waists would be complete without mention of this former waist treatment generally made famous by American movie stars on and off the silver screen. It’s distinguishing characteristic is having no waistband at all, relying instead on pleats, darts, and seams to define an elegant taper to the natural waist. When cut and fit properly, the construction is not only visually sleek, but extremely comfortable, with the weight of the garment distributed evenly across the hips rather than cinched at the waist -- rather like how well-cut shoulders render a coat weightless on the back. These are the trousers Astaire famously belted (through dropped loops) with a necktie, and which a young Sinatra never quite filled out onstage with the Dorseys. Purely of vintage provenance or a bespoke prerogative these days, and shown in the final image below by yours truly. In conclusion, whether belted, strapped, suspended, or tied, waist deportment, like jacket breast pocket decor, is one more opportunity for the outside-the-fashion-beltway-blade to demonstrate his independent haberdashery bon-a-fides.